Endoscopic Discectomy is an innovative, minimally invasive procedure which works for the reduction of back pain caused by disc herniation or sciatica, which has not responded to conservative management. In this procedure physician can remove herniated or protruding portion of an intervertebral disc which may be compressing the spinal cord or the nerve root. Endoscopic Discectomy is a minimally invasive procedure; it is a good procedure in those cases in which conservative treatments and therapies did not work.These treatments and therapies includes medication, physical therapy, epidural injections radiofrequency ablation etc. • Fast recovery and return to work and activities. How is Endoscopic Discectomy actually performed? Patients are sedated or under local anesthesia during the procedure. 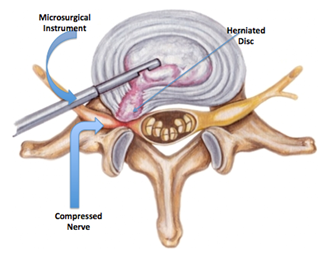 A small incision takes place on the side of the back so that endoscope and other instruments could pass through disc space. A monitor displays live, enlarged images through the help of camera on the Endoscope. After all the setup surgeon starts removing the damaged portion of the disc as well as other disc material which may be pressing the nerves and causing pain. When it is completed endoscope is removed and an incision is closed. This whole process may take one hour to complete. As ever patient becomes comfortable and surgical pain decreases surgeon allows the patient to walk. As it is a small incision procedure, a patient could be discharged within one or two days. Some of the patients gave feedback about immediate pain relief, some other felt pain relief in three to six weeks. Doctor allows all activities with some control as bending forward, lifting weight and sitting more than 10 minutes. The patient could join his work again after three weeks of procedure. The doctor advises follow up sessions after procedure as after 2, 6 and 12 weeks so that symptoms as back pain, leg pain, and the neurological deficit could be evaluated. • Patients who are prone to bleeding. • A patient with a fully extruded disc that has migrated up into the spinal canal. • A patient with extensive spinal stenosis. In some cases, an open surgical procedure is required to remove bone that is compressing the nerves. • When spinal instability is extensive and the patient requires a spinal fusion using an open surgical procedure.